There is a reason Eid ul Azha is called Meethi Eid (sweet eid) in Pakistan – the day begins with sweet Vermicelli and dates pudding, people give sweets and cakes for Eid gifts and then wherever you go, you will find the desserts ruling the food scene. Actually all memories associated with Ramadan and meethi Eid are sweet, filled with love, laughter, gifts, bright colours,family and friends’ get togethers. Desserts are an inseparable part of the three days long festivity. If you have a sweet tooth, Eid is the time of the year for you and if you are watching weight, then God help you! 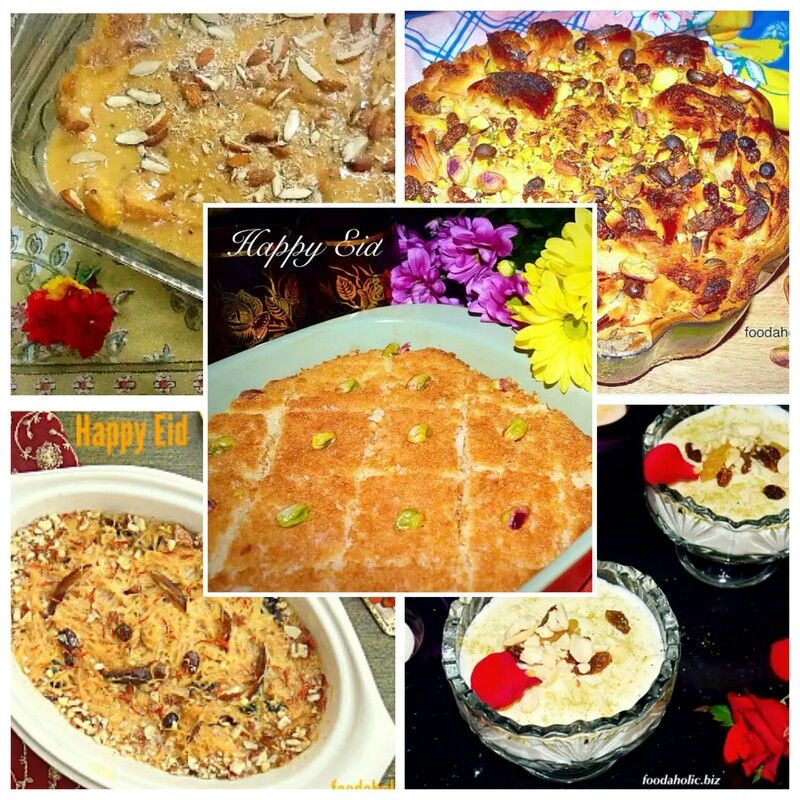 Here are a few quick and easy Eid desserts to make your Eid super sweet and scrumptious. Traditionally sheer ( milk ) and Khorma ( dates ) are the main ingredients besides vermicelli. But this recipe is loaded with all kinds of nuts and dried fruit, which make it quite an energising treat after a month of fasting . Preparations for this dessert/breakfast begins as soon as the Eid moon is sighted, for as long as I remember I’ve seen my mother soaking and chopping dry fruits first thing the night before Eid. As soon as the Eid prayer is over Sheer Khorma is served as breakfast in every household I know of amongst my family and friends. It’s a must for dessert on Eid party table and hostess trolley. Oodles of crushed puff pastry (one of my weaknesses but don’t tell anyone), lots of mixed nuts and dried fruits, soaked in hot sweetened milk and a crispy caramelised top, broiled to perfection . That’s my definition of real food! If you agree, put on that apron and get baking to celebrate good food, life, friends and family. A quick n easy version that gets done within 20 minutes! Perfect for big gatherings. A no-bake, egg-free Persian dessert that has crispy pieces of golden fried bread soaked in a mixture of sweet and creamy milk and cardamom syrup. A delightful indulgence that becomes the star of the show at any festive table. Traditionally it’s made by thickening the milk which takes a long time. I’ve used condensed milk to speed up the cooking process . Even making a big batch for a last minute dessert solution gets done in a jiffy. This glorious semolina coconut cake, flavoured and fragranced with lemon, rose water and cardamom sweet syrup and garnished with pistachios shall fill your day with golden moments and sweet cheer. Very quick n easy, mix in one bowl cake is perfect for a sudden sweet craving or last minute dessert solution for any celebration. Sweet and simple rice custard taken to new heights of rich indulgence with very few ingredients and no extra effort involved. Layers upon layers of subtle and ethereal fragrance with nutty, earthy, spicy and floral all flavours combined in a creamy smooth custard. Serve warm or chilled for a quick sweet temptation or beautiful festive treat . Eid Mubarak to all, with love from Pakistan !